When Microsoft discontinued Threat Management Gateway (which once was Proxy and then ISA server) I must admit I was disappointed; it was a relatively inexpensive authenticated reverse proxy that worked with Exchange Server as well as many other complicated products. In the interim we were told that Unified Access Gateway would be the replacement, but that product isn't as well suited to the task. Several alternatives are out there, including: Kemp, F5, Nginx, and Squid but either the price or the relative difficulty of setup isn't in line with TMG. Fortunately starting in Windows 2012R2 Microsoft introduced Web Application Proxy which largely fills the gap. 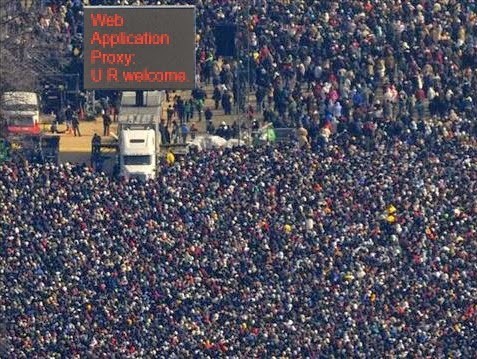 Web Application Proxy/Server 2012r2 release party.Trust me, I paid big bucks for this insider photo. 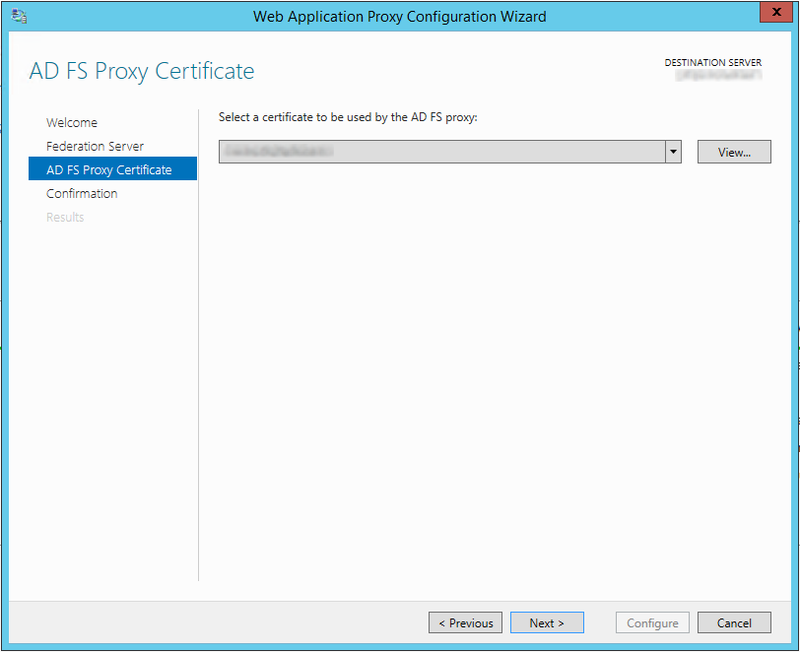 What is Web Application Proxy? 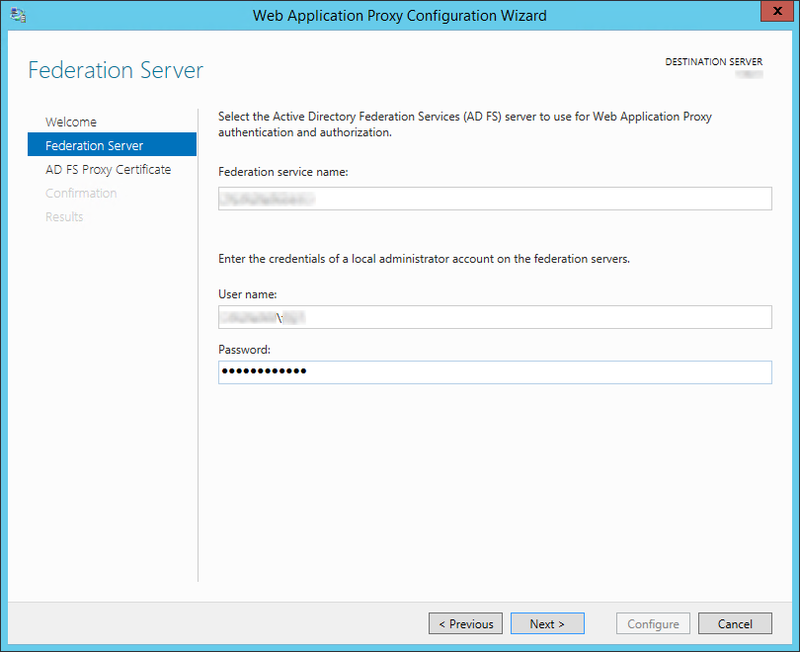 Web Application Proxy (WAP from henceforth) is based on and replaces Active Directory Federation Services Proxy 2.0. In addition to the ADFS Proxy functionality it also introduces the ability to expose internal resources to external users. These users can be pre-authenticated (and then impersonated for SSO) against your Active Directory infrastructure using ADFS prior to being allowed access to resources. Wait, This is ADFS Proxy 3.0? 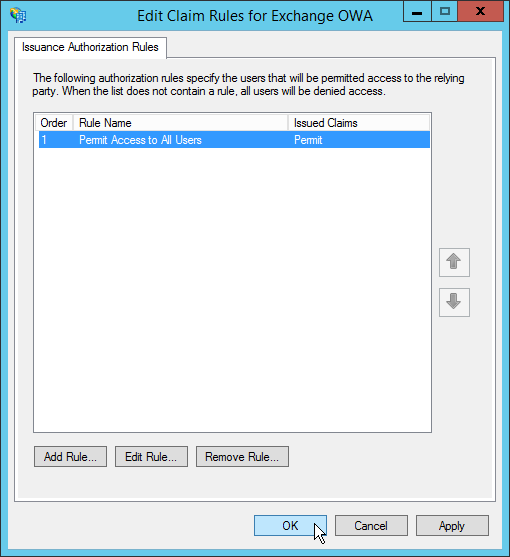 Authorize external users for access to other claims-aware external or internal resources (Generally SaaS). 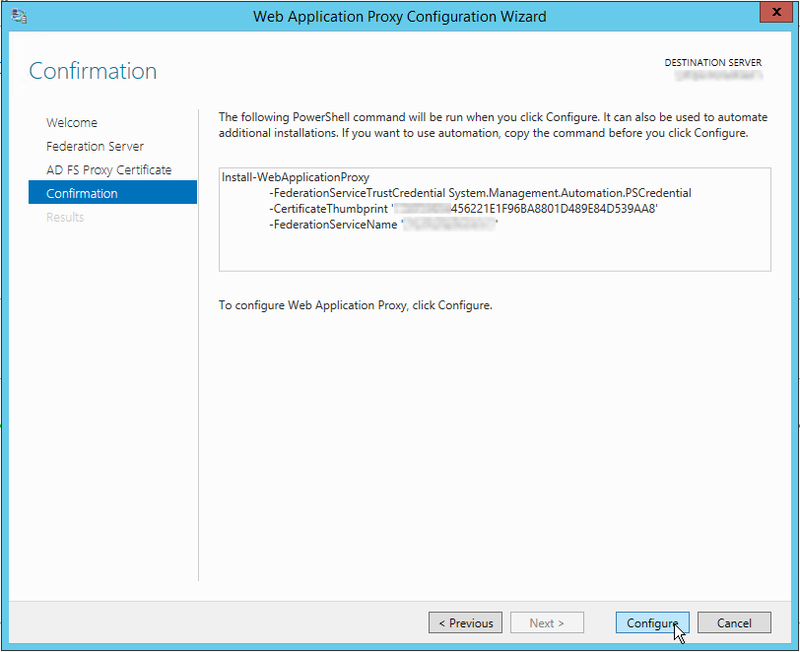 Allow access (by "reverse" proxy) to multiple internal applications on the same port. 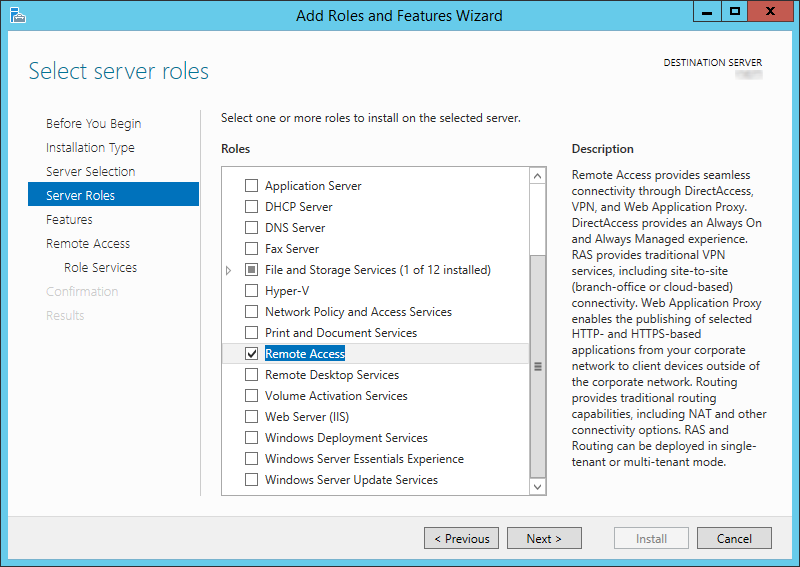 Web application proxy is available on Windows Server 2012 R2 and higher, and it requires ADFS 3.0 to be available on the back end. 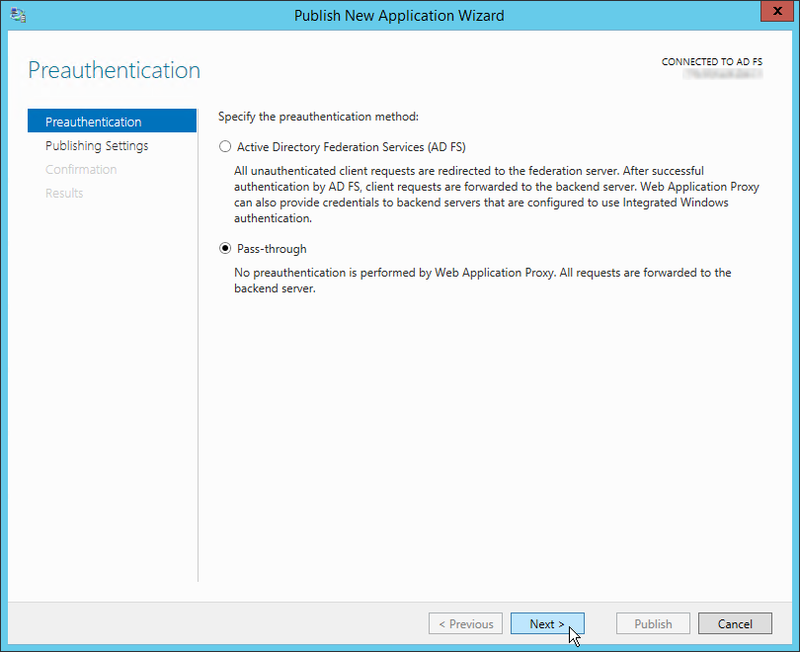 For assistance in setting up ADFS 3.0, see my article here. If you would like to proxy authentication for non-claims aware applications, I.E. 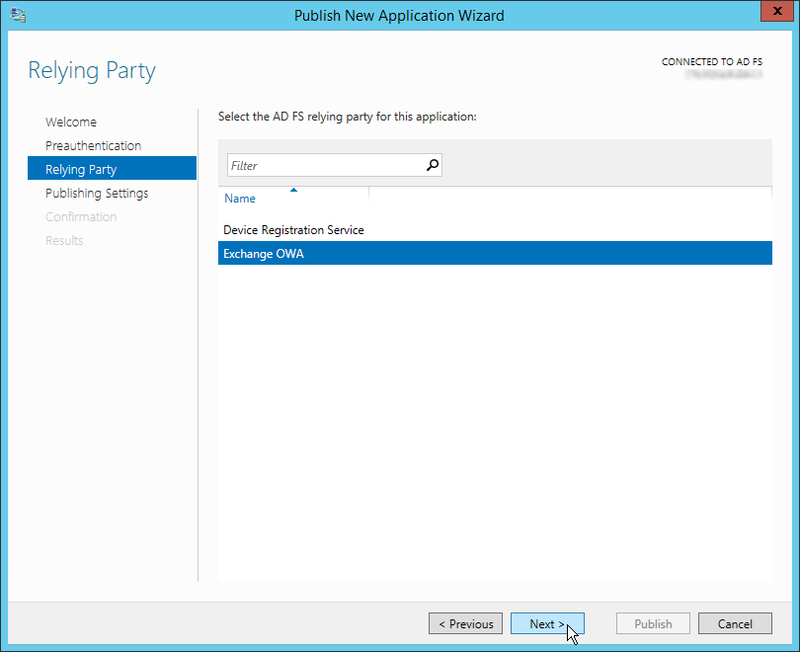 Exchange OWA pre-2013 SP1 (SP1 Claims) or Kerberos/NTLM apps, you will need to have the WAP server joined to your domain. Additionally, you'll need the certificate (private and public key) from your ADFS server and one certificate (again, private and public) for each application you intend to proxy. These certificates must be trusted by your clients, so generally external globally trusted (Digicert for example) certificate authorities are preferred. The certificates need to be installed under the "Personal" portion of the "Local Machine" store on the machine you intend to use as your WAP proxy. If you only intend to host internal resources to domain-joined computers connecting remotely you can use an internal PKI provided your clients trust your issuing CA(s). For information on how to setup an internal CA, see my article here. If you need help exporting your public and private key from your ADFS server and other services, see this article. Note that if these certificates are marked as non-exportable you will need new certificates for those services, so make sure you plan accordingly. As for the hardware you can use either real hardware or a VM assuming you have a proper DMZ NIC setup on your Hyper-V/ESX/Xen/whatever host(s). WAP is not a particularly demanding application and uses very little I/O. It is also horizontally scalable with a network level load balancer (f5) so I won't give direct guidance on specifications since it would likely have little relevance to your configuration. As in most cases, performance evaluation and configuration change is the way to go. First open the "Network and Sharing Center" and click "Change Adapter Settings". Re-name the NICs "External" and "Internal" according to how they are connected to avoid confusion during set up and troubleshooting. Give each NIC appropriate IP address settings. The subnet for each will depend on your firewall/switch configuration. Some firewall configurations may require communication stay on a single subnet but if given a choice it is generally better to have them on different subnets. (2 NICs) Leave the default gateway on the internal NIC blank. If your WAP server is not domain joined because you intend on using only claims auth or passthrough (not delegation) then leave your DNS servers blank on the internal NIC as well and be sure to execute step 4. 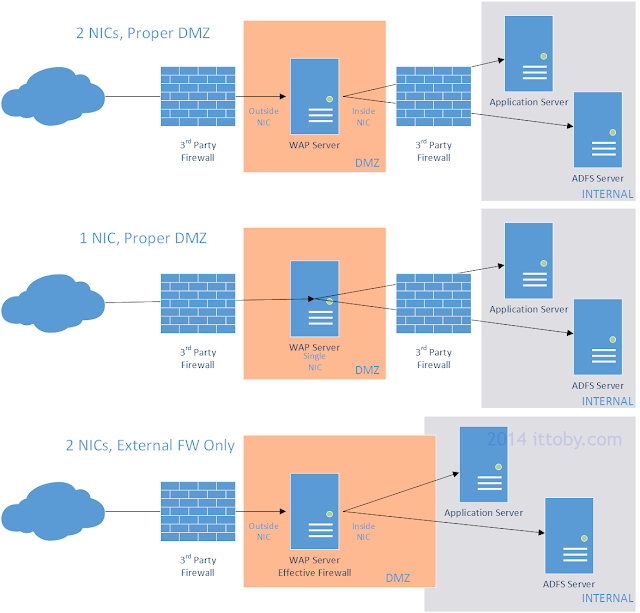 If the WAP server needs to access resources (ADFS, DC, App) on a subnet other than that the internal NIC is connected to, you will need to add a static route to the server so it knows how to get to that network. For example, if your WAP server is on 192.168.1.10/24, your ADFS server is 192.168.2.5/24, and your gateway is 192.168.1.1, you would issue the following command from an elevated command prompt: route ADD 192.168.2.0 MASK 255.255.255.0 192.168.1.1 IF 192.168.1.10 -p . For more information, see this article. <Only if you haven't specified DNS servers on the internal NIC>To look up the ADFS server for claims verification you will need to add each internal ADFS server address to your %SYSTEMROOT%\system32\drivers\etc\hosts file. Do this now; if you need further instructions see this article. Now we'll secure the external NIC. Open the properties of that NIC and on the "Networking" tab unbind everything except for "QoS Packet Scheduler" and the protocol you intend on using (IPv4 or IPv6). 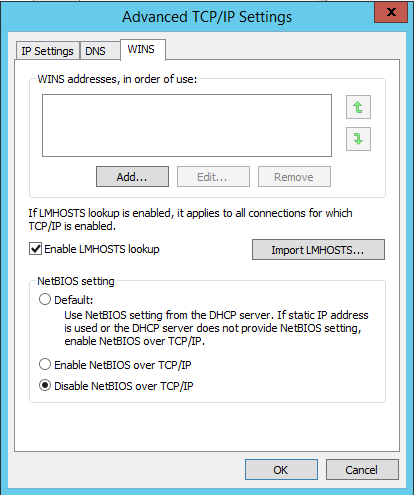 If using IPv4, drill into the properties of that protocol and select "Disable NetBIOS over TCP/IP" under the "WINS" tab. 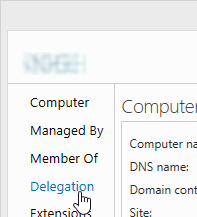 Also ensure you disable "Register this connection's address in DNS" on the "DNS" tab. On your internal firewall, open ports necessary for AD/other communication. Here is an excellent guide. In server manager, click "Manage->Add Roles and Features". Click "Next" on the "Before you begin" screen. 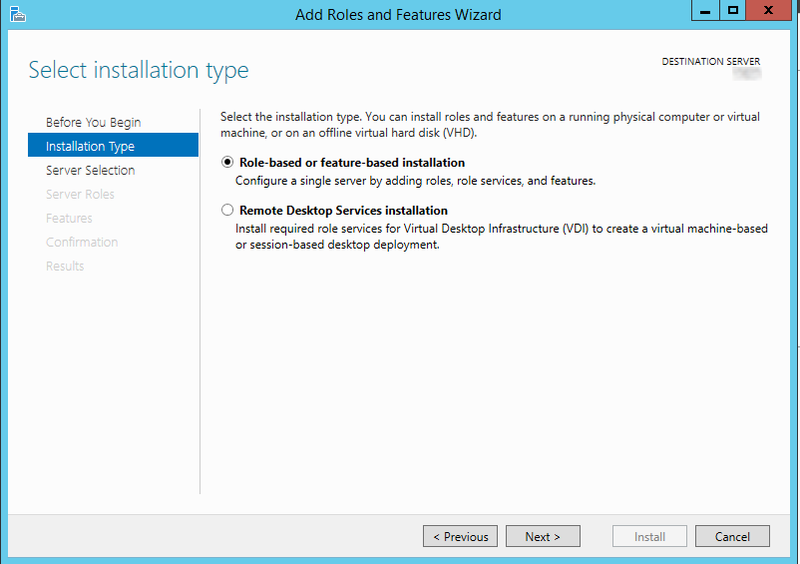 For "Installation Type" select "Role-based or feature-based installation" & click "Next". Select your desired WAP server and click "Next". 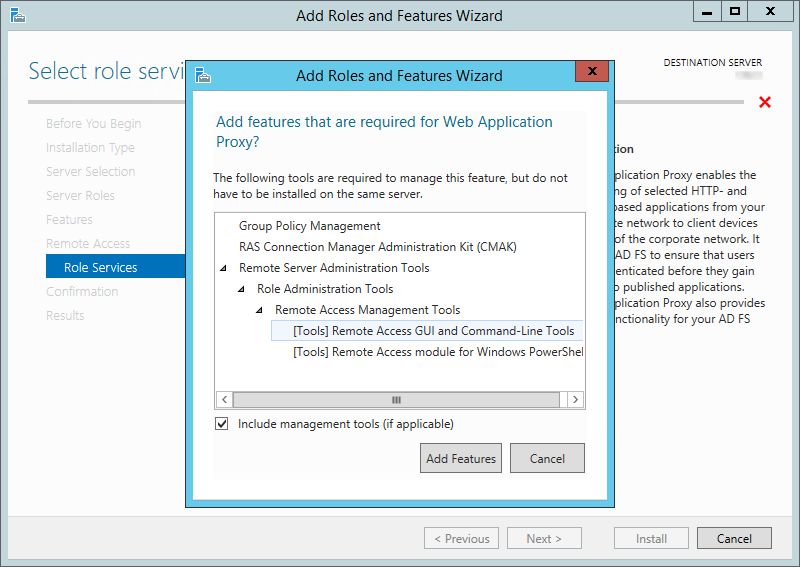 On "Add Roles and Features Wizard", select the "Remote Access" role and click "Next". You do not need to select any features; click "Next" on the "Select features" page. Read the dialog presented on the "Remote Access" screen and click "Next". Leave "Include management tools" checked and click "Add Features". On the "Select role services" page select "Web Application Proxy" and click "Next". When presented with the confirmation screen, click "Install". Prerequisite Note: For this step you will need the public and private key for your internal ADFS server(s) installed to the "Personal" section of the "Local Computer" store on your WAP server. For more information, refer to "Software Requirements" above. After installation, server manager will notify you that configuration is required. 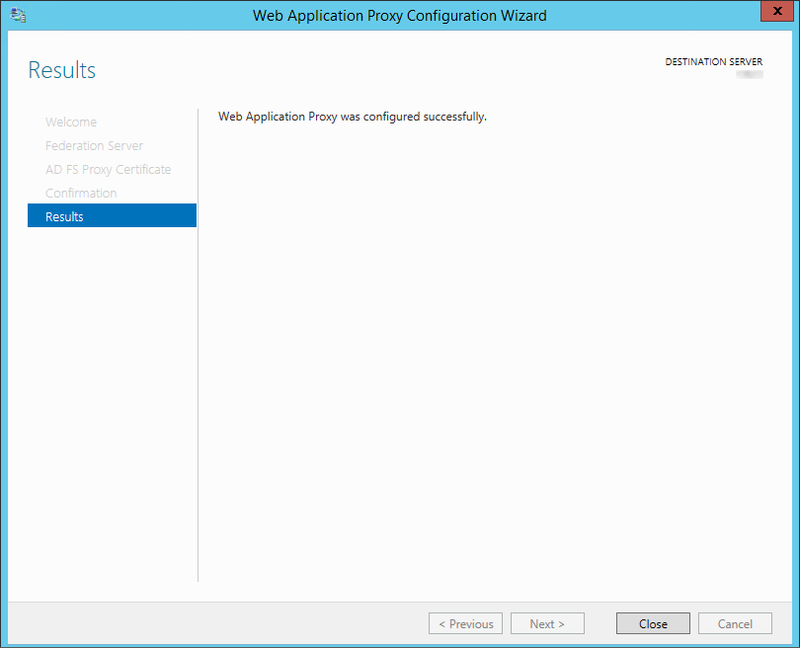 Click the notification flag and select "Open the Web Application Proxy Wizard". 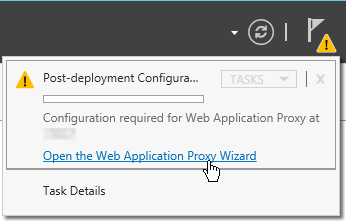 On the "Welcome" screen of the "Web Application Proxy Wizard" click "Next". On the "Federation Server" screen, enter the external fully qualified domain name of your federation service. This needs to be registered in external DNS (i.e. resolvable from the internet). For more information, see my article linked under "Software Requirements". Insert the username/password of a domain administrator account to properly register this as a proxy server. This account will not be used after this point, so a service account is not necessary. Click "Next". Select the ADFS certificate you installed earlier from the dropdown and click "Next". You'll be presented with the configuration details. If you intend on setting up another WAP server for load balancing copy the powershell command down for later use. Click "Configure" to continue. You should see the message "Web Application Proxy was configured successfully". On the left-hand navigation pane, select "Operations Status"
The status of the WAP server will be relayed in the middle pane. Do not be surprised to see the server listed twice, once for the FQDN and once for netbios. This is normal. Now that setup is complete, let's move on to publishing! 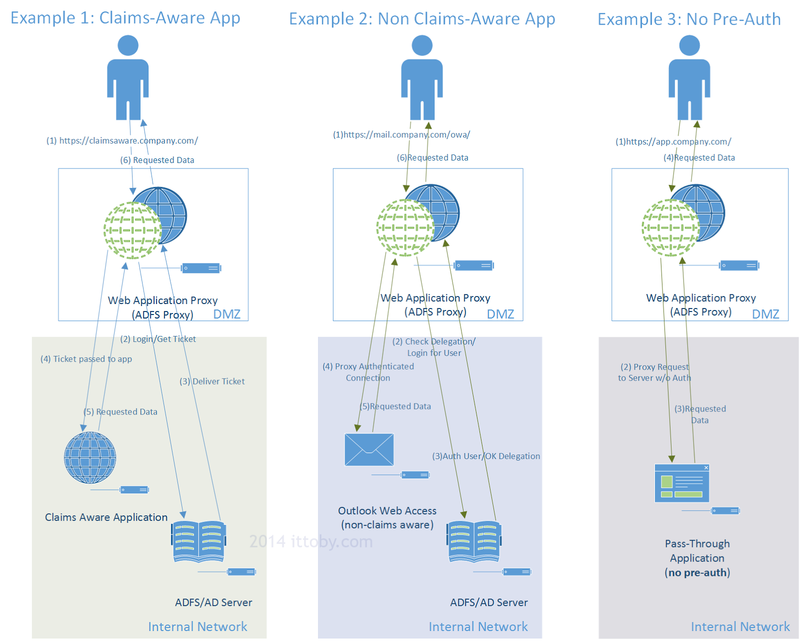 Now that we've completed the ADFS/WAP setup, let's walk through the setup of a non-claims aware application using Kerberos/NTLM delegation. 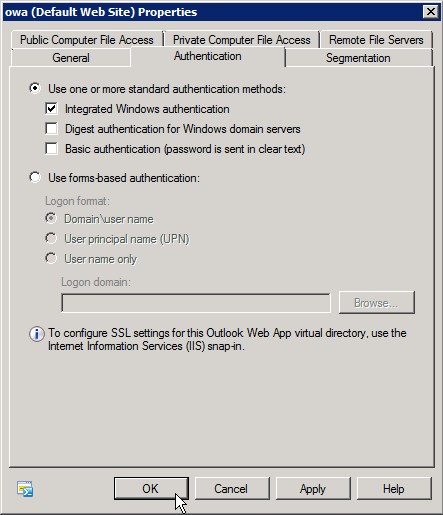 A popular example would be Exchange Outlook Web Access; I'll be using version 2010 SP3. 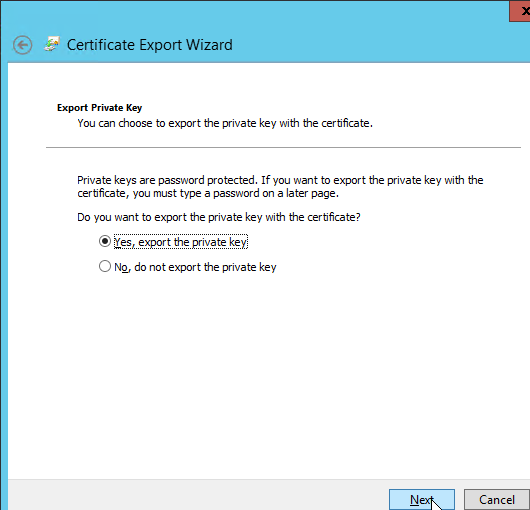 Prerequisite Note: For this step you will need the public and private key for the services you wish to host (Exchange OWA in this case) installed to the "Personal" section of the "Local Computer" store on your WAP server. Requests destined for your back-end service are decrypted and re-encrypted at the WAP server. For more information, refer to "Software Requirements" above. 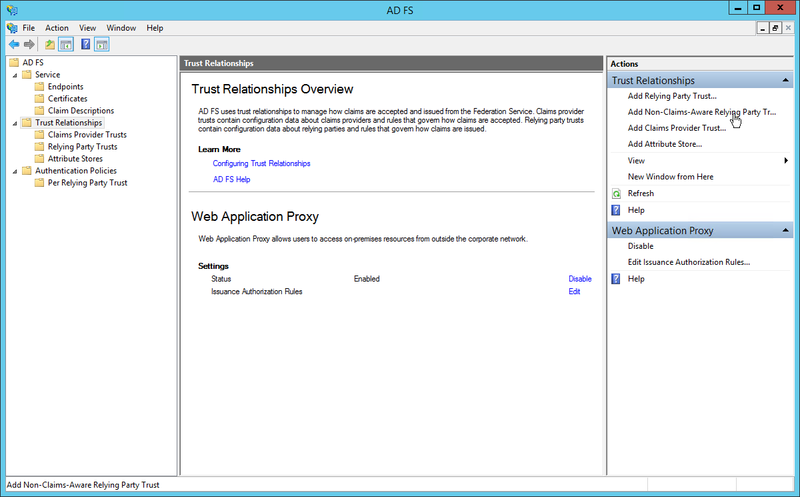 Open the AD FS management tool and click the "Trust Relationships" folder on the left hand navigation pane. 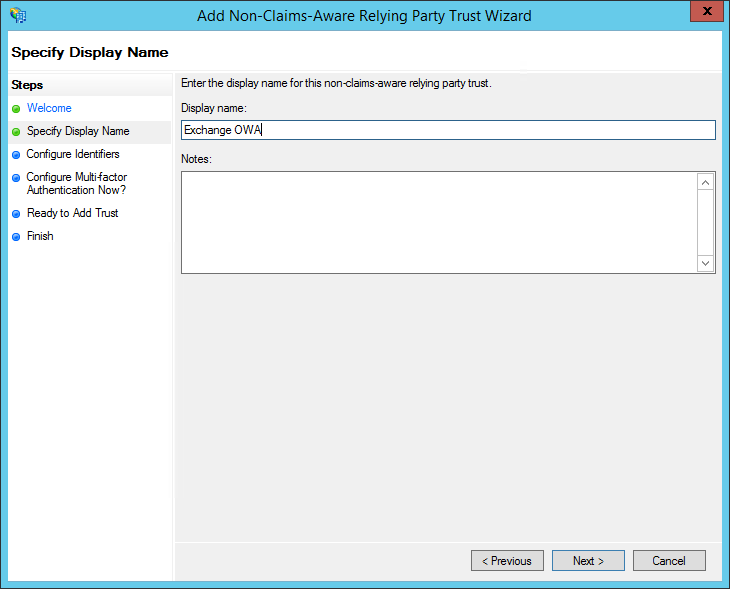 In the right hand action pane, click "Add Non-Claims-Aware Relaying Party Trust". A wizard will pop up; click "Start" on the welcome screen. Give this rule a (human) meaningful name, i.e." <Servername> Exchange OWA" along with a description if desired and click "Next". 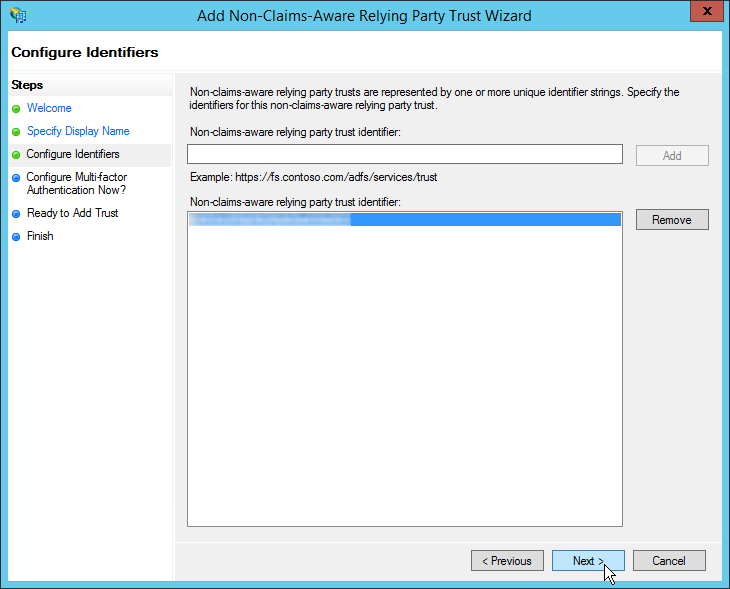 Now we'll add the non-claims aware relaying trust party identifier (which in this case is simply a URL). Enter the external fully qualified domain name of the server complete with url path ending in a trailing forward slash, i.e. https://mail.company.com/owa/ and click "Next". Note: WAP identifiers must end in a trailing slash even though the MSFT example doesn't look that way. On the next screen, "Configure Multi-Factor Authentication Now? ", you can set up multi-factor authentication should you desire. I will not be configuring multi-factor for this demonstration, but note you can always set it up later if desired. Leave "I do not want to configure..." selected and click "Next". Review your configuration on the "Ready to Add Trust" screen and click "Next". The "Finish" screen will have a checkbox starting with "Open the Edit Authorization Rules dialog..." that is checked by default. Leave it checked because we will want to specify who is allowed access through to the back-end via this rule right away. Click "Finish". A dialog box titled "Edit Claim Rules for <Rule Name>" will come up allowing us to define who should be allowed access via this rule. Click "Add Rule'. You will be asked to select a rule template. What you select here will depend on what is reasonable for your environment. You should create (a) rule(s) that correspond with the least access required possible as anyone getting past this point will be able to attempt to authenticate directly against the target internal resource. You may, for example, want to use a specific Active Directory group with only the users that need access to this resources. For the purposes of testing and this article, however, I will be using a simple "Permit All Users" rule. This will allow anyone in AD through and is suitable for testing or in addition to other rules. Select the rule template and click "Next". 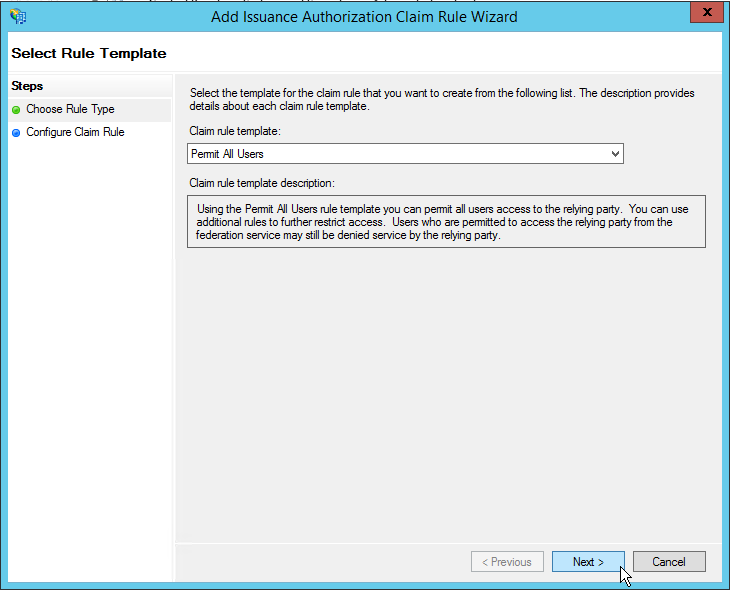 Click "Finish" to close the "Add Issuance Authorization Claim Rule Wizard"
So long as you do not want any additional rules, click "OK" to close the Edit Claim Rules dialog box. Now we need to configure our back-end service to accept the authentication coming from the WAP server. In our case we will need to change the authentication mechanism allowed by Exchange from forms based to integrated authentication.Your steps here will differ depending on what service you are offering up. 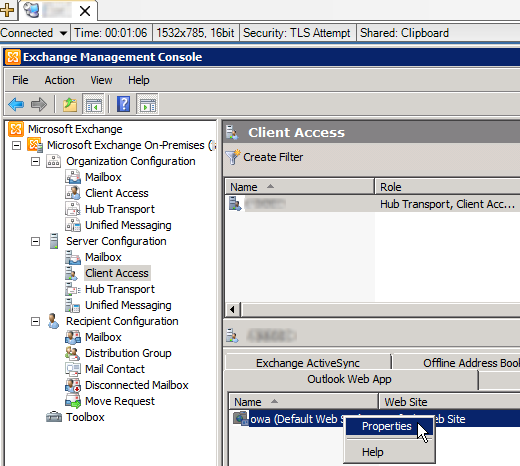 Open the Exchange management console and Click on "Server Configuration"->"Client Access"
For each server in your Exchange farm, click the "Outlook Web App" tab, then right click "owa (Default Web Site)" and click "properties". 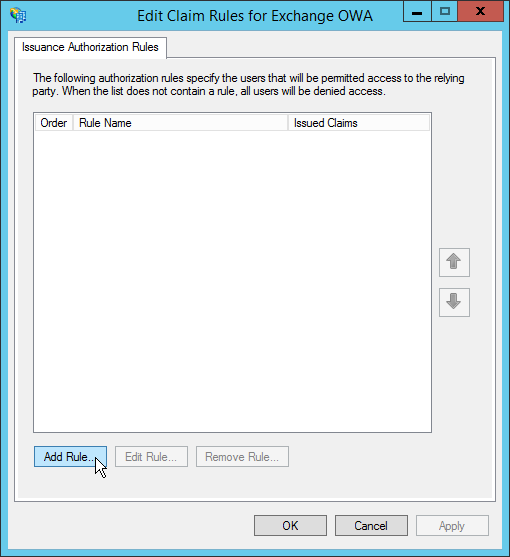 Select the "Authentication" tab and click "Use one or more standard authentication methods:" then select only "Integrated Windows authentication". Click "OK" on the warning. Repeat steps 2 and 3 for the "ecp (Default Web Site)" under "Exchange Control Panel" on each server. Now we'll configure the WAP server AD computer object so that it can pass authentication to your back-end server(s). Note the SPNs referenced to not need to be manually registered at a domain level. Navigate to and open the properties of the WAP server computer object. Click or scroll down to the "Delegation" section of the object. 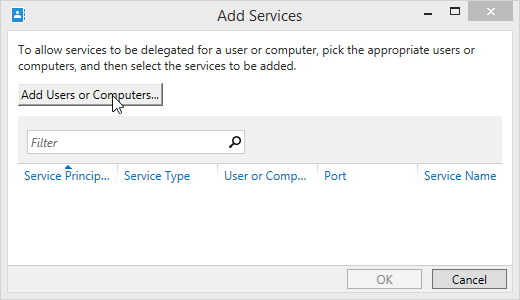 Select "Trust this computer for delegation to specified servers only" and "Use any authentication protocol" (since we'll be using NTLM here; select Kerberos only for applications that support it) then click "Add..."
When presented with the "Add Services" dialog, click "Add Users or Computers...". Type the name of the back-end Exchange server(s) and click "Check Names" and then "OK"
Scroll to the http/SERVERNAME.domain.ext (since we're serving up the HTTP protocol; change if your app differs) and select it, then click "OK". 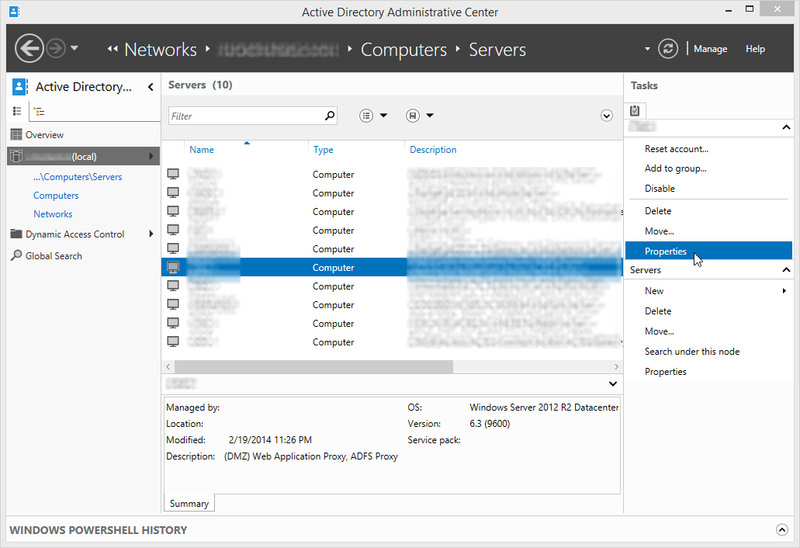 Note: If using Active Directory Administrative Center you need to add the FQDN name and the NETBIOS name; if using Active Directory Users Computers you need only add the FQDN and both will be added. Finally we'll configure WAP publishing for this application. 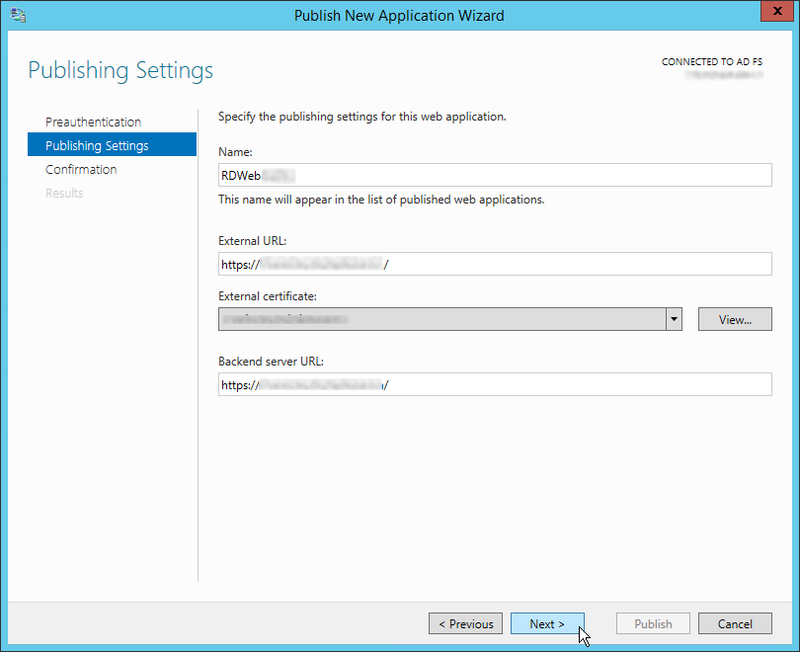 In the left hand navigation plane, select "Configuration"->"Web Application Proxy"
On the right hand action pane, click "Publish"
A wizard will come up. Click "Next" on the welcome screen. 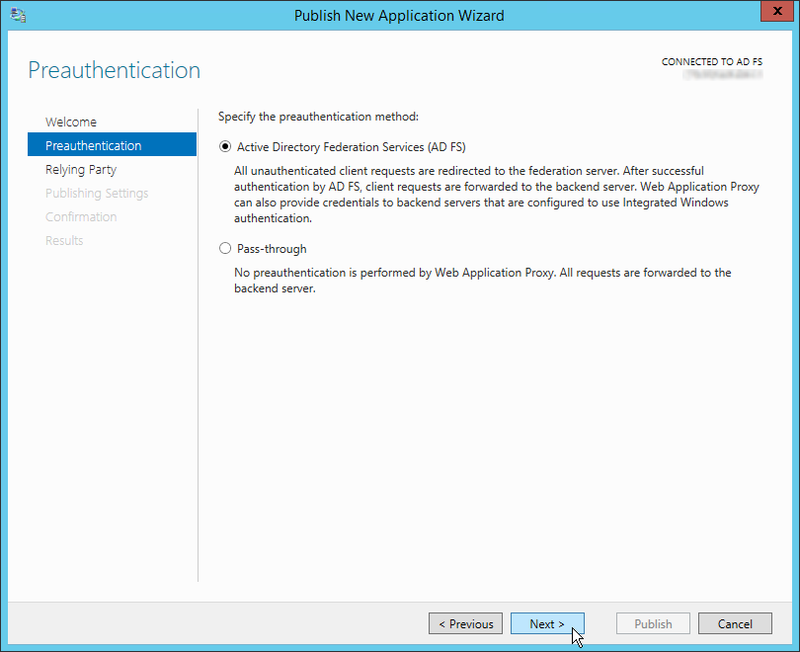 When prompted for preauthentication type, select "Active Directory Federation Services (AD FS)". This ensures requests are authenticated by ADFS prior to being passed onto the back-end server. Click "Next". 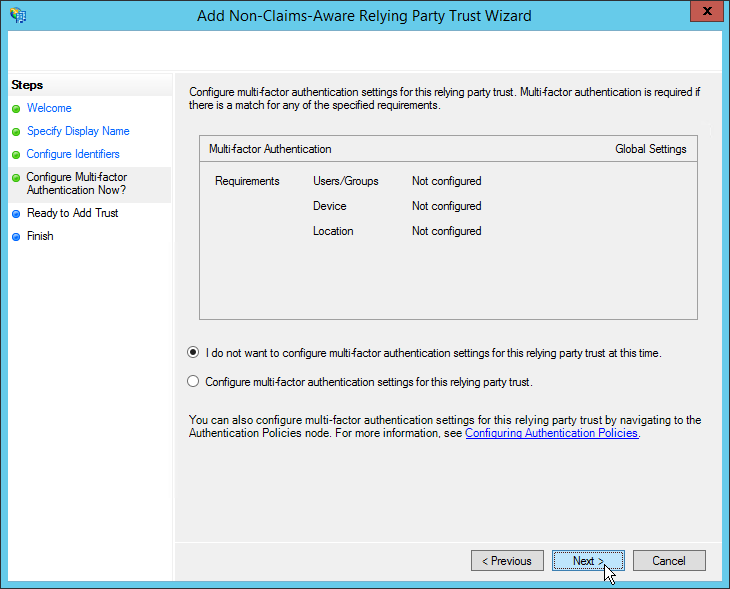 For "Relying Party", select the trust rule we created earlier under the "Trust Setup" section above and click "Next". Now the meat of the settings; on the "Publishing Settings" step enter a meaningful name for this connection (i.e. 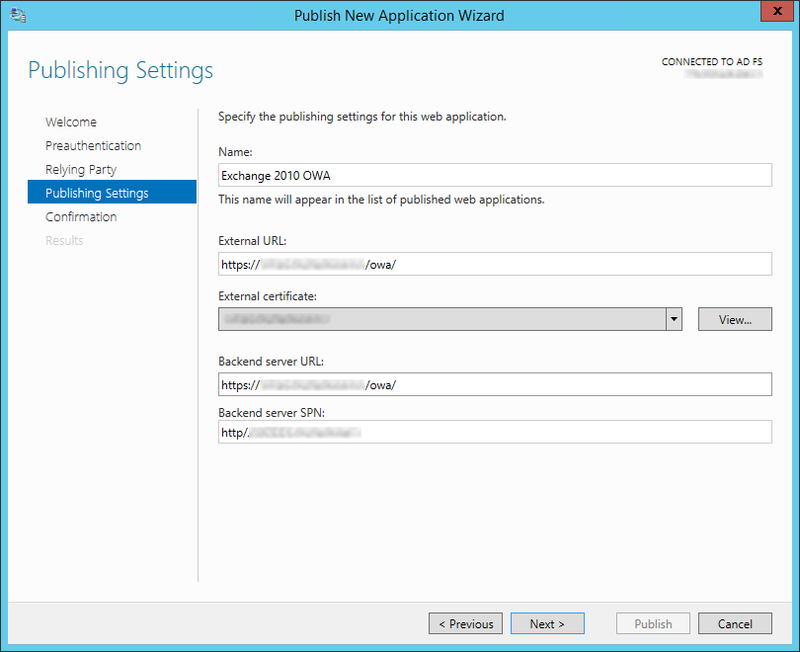 Exchange 2010 OWA), the external URL it will be accessed by (i.e. https://mail.company.com/owa/), select the external certificate for that service (see "Software Requirements" above), the internal URL (preferably should match the external but doesn't have to in all cases), and the server SPN that we specified on the step above, then click "Next". You will be shown the confirmation screen with the appropriate PowerShell command line for the options you have configured. Should you want to repeat a similar publishing step, copy and retain this command line for use later. Click "Publish". The results screen will display the publishing status. Assuming all is well, click "Close" to close the wizard. Passthrough applications are substantially easier (and less secure) because they do not require any set up in ADFS and do not subject the user connection attempt to any authentication before passing it on. This isn't to say the back-end service won't require authentication, however, but it is still less secure since you are opening your back-end service up to processing logon requests directly from the internet. 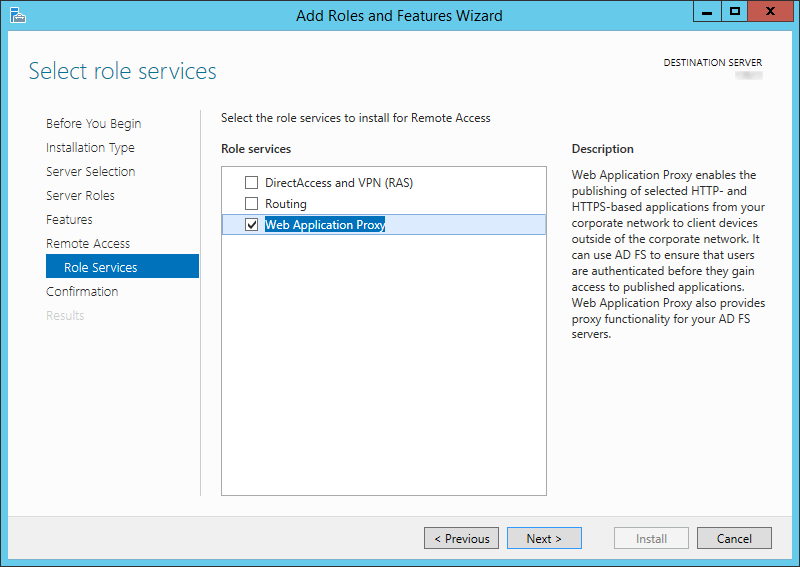 In this example I will publish RDP proxy direct to the internet proxied through the WAP server. This allows me to serve up this application on the same IP address and port as other services assuming the hostname requested is unique. Again, this section assumes the public and private keys associated with the URL you intend to use installed in the WAP server's "personal" store. In my example I use a hostname of "rdp.company.com"
When prompted for preauthentication type, select "Pass-through" and click "Next". On the "Publishing Settings" step enter a meaningful name for this connection (i.e. RDProxy), the external URL it will be accessed by (i.e. https://rdp.company.com/), select the external certificate for that service (see "Software Requirements" above), and the internal URL (preferably should match the external but doesn't have to in all cases). Click "Next". 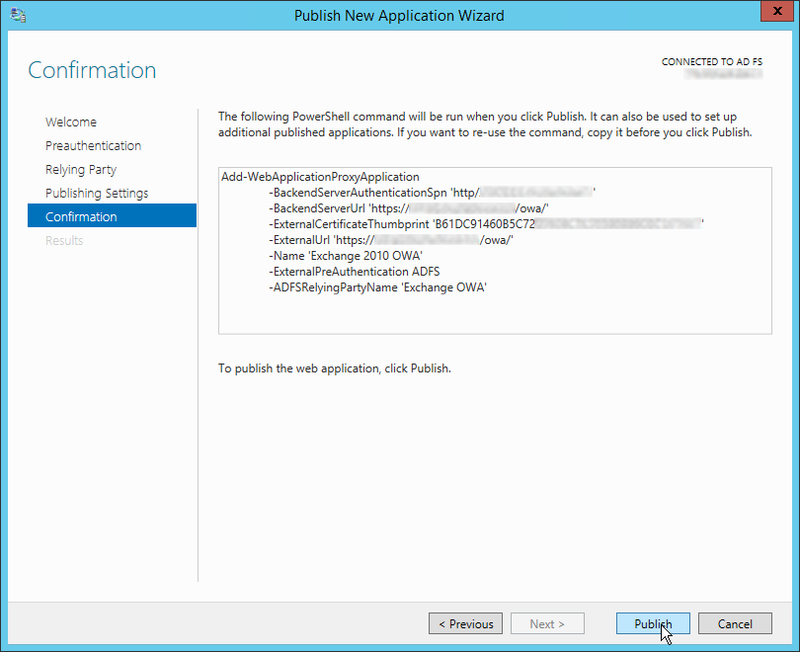 You will be given a summary of the publishing rule about to be created and a Powershell command of it's equivalent. If you are satisfied with the details click "Publish". Should you need to enable debug logging, there is an excellent article here demonstrating how to do so. One word of caution, however; should you edit the C:\Windows\ADFS\Config\microsoft.identityServer.proxyservice.exe.config referenced therein I recommend backing it up first. 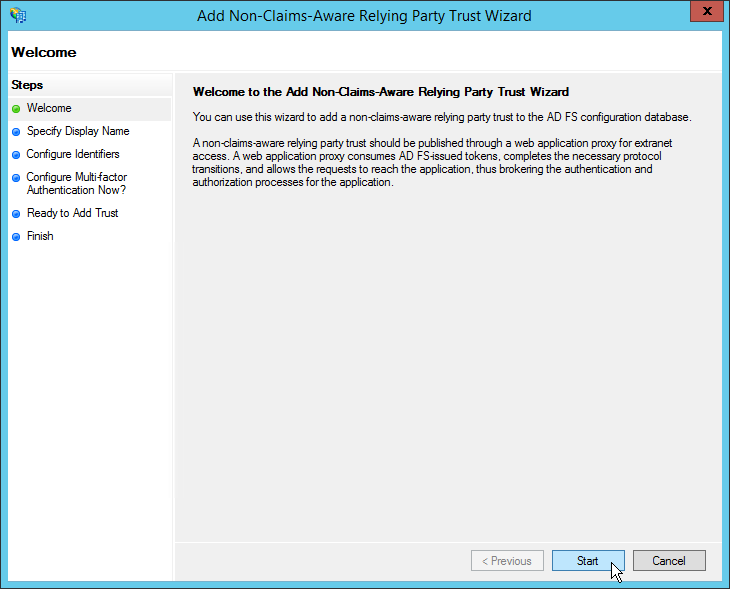 If not formatted correctly WAP will start up successfully with the values listed in the file, but when it comes time to rotate the ADFS Proxy Trust certificate (an automatic action that happens once every 3 weeks) the configuration of the new cert will fail. In that case you would see an Event ID 422 logged to AD FS/Admin stating "Unable to retrieve proxy configuration data from the Federation Service.". Want more? Here are some wonderful resources! Thanks for reading, if you have questions or comments leave them below! I've followed your tutorial and I got an error message during the WAP Configuration between step 5 and step 6. It tells me : "An error occured when attempting to establishe a trust relationship with the federation service. Error: Unable to connect to remote server". After that, one certificate with prefix "ADFS Proxy Trust" has been created in my personnal store. The certificate I use is the certificate of the server where my internal certificate authorities is installed. But the CN of the certificate is not the FQDN of the server. Is it the reason why the ADFS Proxy enrollment failed. It could be, though not for certain; I'd think if done correctly you may still be able to register, but it would fail later if the name wasn't correct. 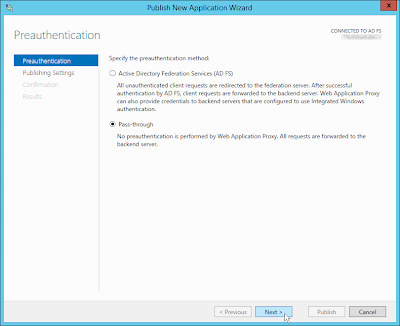 The certificate should be your external FQDN and come directly from your ADFS server. The ADFS Proxy Trust certificate is normal and a good sign. That is the certificate that is auto-generated between ADFS and all the proxies connected to it. It will be auto-rotated as part of the service. In addition to trying again with the FQDN(external) cert from the ADFS server, double check your network and firewall settings to ensure they can communicate effectively. If all else fails, check the event logs on the ADFS server as well as the ADFS proxy. Provided the connectivity is ok, the interesting logs would likely be on the ADFS server itself. Thank you for this post, which help me to begin with WAP! Do you experience wildcard certificate usage with WAP? I have limited experience using wildcards, but from what I have seen it is possible. Though there is conflicting information out there I have successfully used a wildcard cert using this technique, which I like because you can still have specific URLs be parsed before the wildcard if desired. It will also fix issues for non-SNI compatible clients such as Android mobile devices. I'd just like to query the security of the WAP server when in pre-auth config. Is the WAP server domain joined? Do MS have any guidance on putting a domain joined Server in a DMZ? We're trying to use WAP for SharePoint 2013 form authentication but the domain joined server in the DMZ is causing a bit of confusion! Yes, if using the pre-auth configuration (applicable with forms) you'll (unfortunately) need to have the WAP server domain joined. 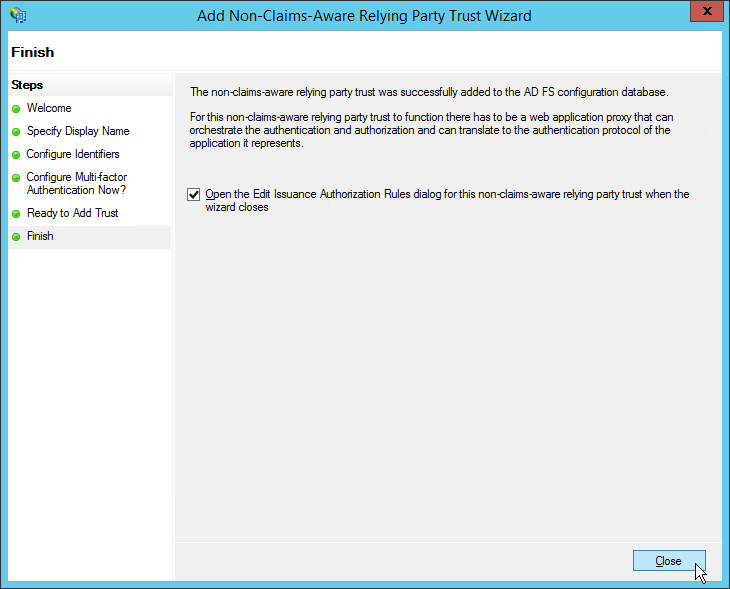 Note that Sharepoint 2013 does support claims or SAML auth, but that will require supporting infrastructure. Using AD auth requires being domain joined (see Plan Integrated... section). If you choose to go with this configuration you will need to take every possible step to harden the domain-joined server for obvious reasons. You will also need to open appropriate ports; clearly you want to lock this down as possible. Note some of those ports won't be necessary for this application (replication, NETBIOS, etc.). You'll also want to configure this server as a NTP client to a DMZ or external source so the timekeeping isn't tied to the domain. If you choose this option start with the fewest number of ports ports possible (be aware of what services your server is using). 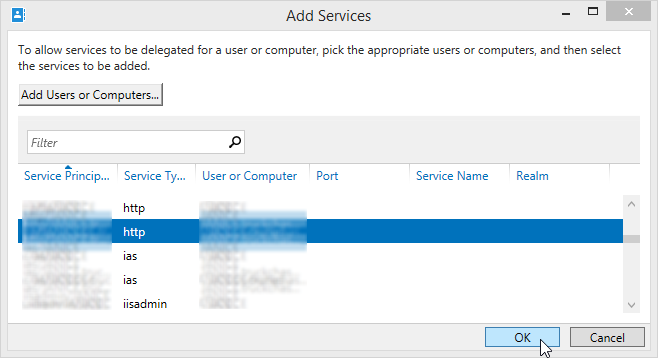 It is preferred to leave this server out of the domain but if its inclusion prevents from opening up ports directly to Sharepoint it may be worth it. Excellent post, very usefull to understand the basics.